The Loft Stage » Spring Play Auditions! 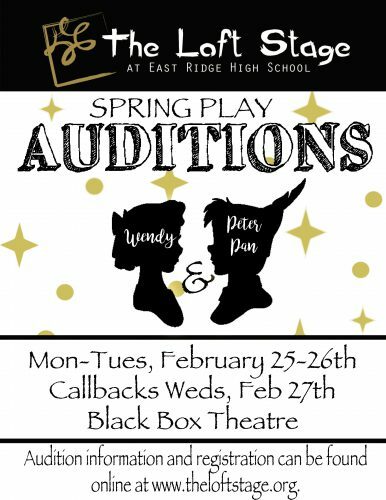 Auditions for this year’s spring play, Wendy & Peter Pan, are Monday and Tuesday, February 25-26th right after school in the black box theatre. Students only need come to one day of auditions. Callbacks will be posted online Tuesday night (2/26) and will take place Wednesday, February 27th right after school. There is no need to prepare anything for the audition; instead, students will be performing cold reads from the actual show. There will be a movement portion to the audition, so please dress comfortably and be prepared to move. While English accents will be used for the show, they are not required for the audition. As always, students are encouraged to read/research the play to get a better idea of the plot, themes, and characters. A full list of characters can be found HERE. Online script access can be found HERE. See Mrs. Carlson in the theatre office or email (kcarlson1@sowashco.org) with any questions. Interested in participating in technical crew? Fill out the tech interest form and join us Friday, March 1st after school in the choir room for our first tech crew meeting. Those unable to the make the meeting should email our technical director, Jimmy Stocco, at jstocco@theloftstage.org.